Mark has been bowhunting extensively throughout North America for 40 years, looking for the best outfitters and areas for our clients. Mark has harvested over 200 big game animals with his bow, including 24 of the North American 29, most of which meet the Pope & Young Club minimums. He also has seven animals in the top 10 list of their species in the SCI Bowhunting Record Book of Trophy Animals from some of his international trips. Mark is a Senior Member of Pope & Young. 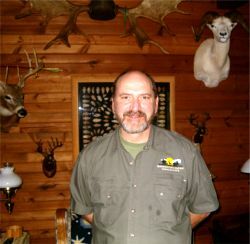 He also served four years as Vice President of Bowhunters of North America and is a member of Christian Bowhunters of America, Safari Club international and others. Mark has not forgotten his bowhunting roots in Ohio and has been a member of that and several other State bowhunting organizations for many years. Mark has authored a number of free lance bowhunting articles, with several to his credit in BOWHUNTER magazine and the PROFESSIONAL BOWHUNTERS SOCIETY quarterly. Mark's background and common sense approach uniquely qualifies him to make intelligent recommendations for North American bowhunting adventures.